KE00007 is a solid phase sandwich Enzyme Linked-Immuno-Sorbent Assay (Sandwich ELISA). 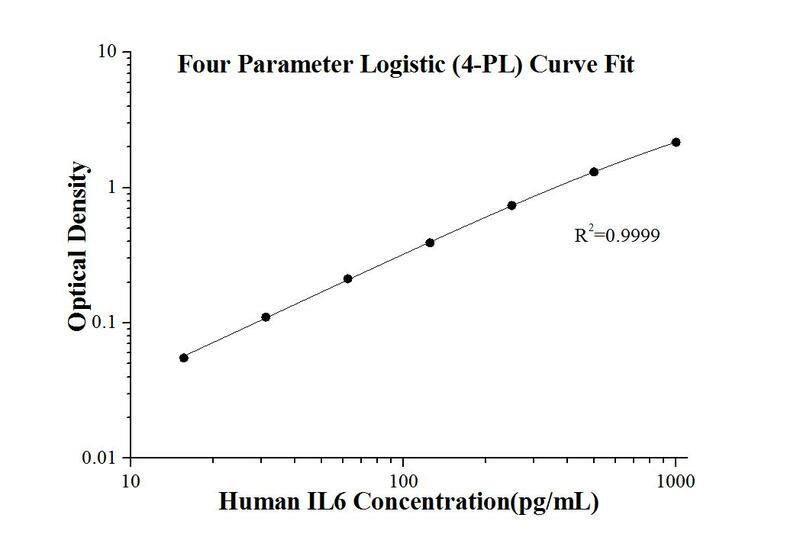 The IL6 ELISA kit is to be used to detect and quantify protein levels of endogenous IL6. The assay recognizes human IL6. A polyclonal antibody specific for IL6 has been pre-coated onto the microwells. The IL6 protein in samples is captured by the coated antibody after incubation. Following extensive washing, a monoclonal antibody specific for IL6 is added to detect the captured IL6 protein. For signal development, horseradish peroxidase (HRP)-conjugated antibody is added, followed by Tetramethyl-benzidine (TMB) reagent. Solution containing sulfuric acid is used to stop color development and the color intensity which is proportional to the quantity of bound protein is measurable at 450nm with the correction wavelength set at 630 nm. Interleukin-6 (IL6) is an interleukin that acts as both a pro-inflammatory and anti-inflammatory cytokine. IL6 protein is secreted by a variety of cell types including T cells and macrophages as phosphorylated and variably glycosylated molecule. IL6 Plays an essential role in the final differentiation of B-cells into Ig-secreting cells involved in lymphocyte and monocyte differentiation. It induces myeloma and plasmacytoma growth and induces nerve cells differentiation Acts on B-cells, T-cells, hepatocytes, hematopoietic progenitor cells and cells of the CNS. IL6 is also considered a myokine, a cytokine produced from muscle, and is elevated in response to muscle contraction. IL6 has been shown to interact with interleukin-6 receptor and glycoprotein 130. Additionally, IL6 is involved in hematopoiesis, bone metabolism, and cancer progression, and has been defined an essential role in directing transition from innate to acquired immunity. Huperzine A attenuates nonalcoholic fatty liver disease by regulating hepatocyte senescence and apoptosis: an in vitro study. Plasma interleukin-37 is increased and inhibits the production of inflammatory cytokines in peripheral blood mononuclear cells in systemic juvenile idiopathic arthritis patients.